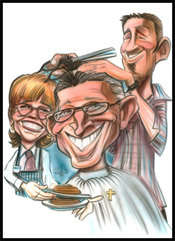 Who Cuts Your Hair and Who Serves You Pancakes? This unique seminar teaches you how to work with people from different backgrounds and cultures. You discover that your personality is perfect for you to become a success. Learn how to admit, adapt, and augment your approach to becoming more effective in your quest for success. Section One: Who Do I Want To Reach? Everything was interesting and worth hearing! I learned how to present myself as a Christian in a non-threatening manner. Bill makes approaching people “simple”. Loved the common sense approach!